Kenny and Zuke’s is a Jewish deli located in Portland. 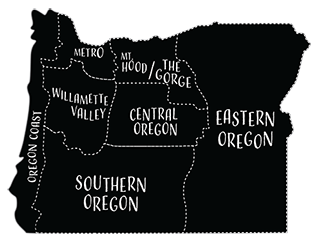 Since 2007 Kenny and Zuke’s strives to bring pastrami and corned beef made the old fashioned way, by hand and with care, to downtown Portland. All the breads are made by hand and the bagels boiled fresh daily. There is something for everyone in the family! 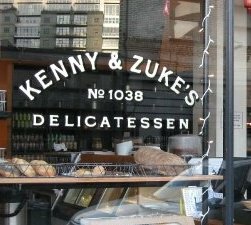 When we started up Kenny & Zuke’s a little over 5 years ago, it was because of the lack of a good Jewish Delicatessen – and decent pastrami, bagels and the like. Little did we realize what we would set in motion. and what the response to it would be! The first thing we had to come up with was a superb pastrami – one that wasn’t commercially produced, and harkened back to the old traditions. So we rolled our sleeves up, and tested, and tasted, and tested some more. And when it was all done and the smoke (oak, to be exact) had cleared, we knew we were on to something. We had developed a true American delicacy – a Pastrami so delicious, so satisfying that it seemed like a new and ultimate comfort food. Yet at the same time, we came to the conclusion that we weren’t really doing anything new. We were, in fact, doing something very old. And in this case – better. And we found that very few people were doing it this way anymore. We were now considered “artisans” when all we were really doing was fabricating something the way it had always been done, before commercialization and standardization took its toll. * Happy Hour served Monday through Friday 3-6pm.